Killington isn’t called The Beast of the East for nothing. The place is big with lots of vertical; it has a great variety of terrain and tons of lift capacity. But where they really earn the respect of diehard fans is in the snowmaking department. Killington has a robust snowmaking system and a skillful, dedicated crew that allows them to open early in the fall, stay open late into spring and persevere in low-snow years. I’m a bit partial since I worked in Killington’s snowmaking department one season but I would argue that the snow they make is better too, as close to the real thing as is possible using pond water and compressed air. 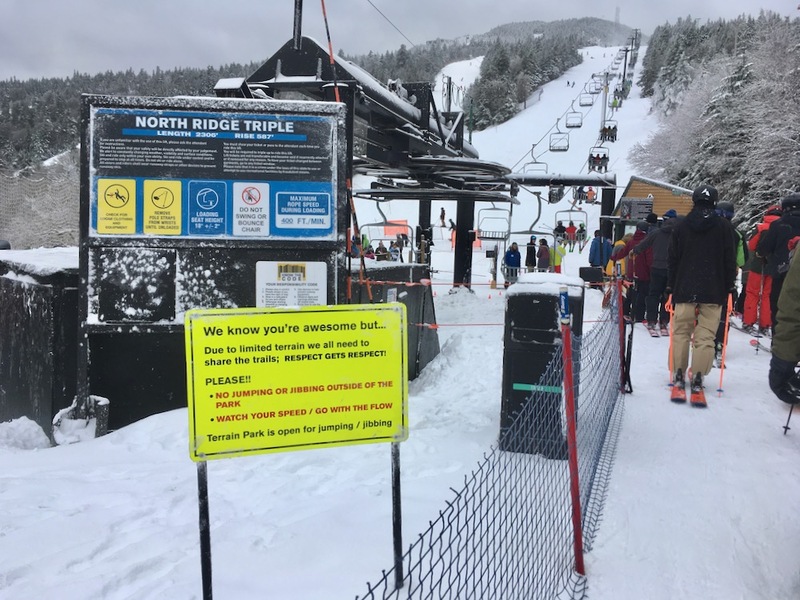 Killington is a great place to go mid-winter when you can make your way around the resort, never skiing the same run twice. But most often my visits are early or late season, when K is the only game in town. This was the case on Saturday when Junior and I couldn’t resist the urge to ski any longer. It had been six months, which was long enough. When we got to the mountain the parking lot was already full and the base was abuzz with activity. What looked like the components of grandstand seating were stacked near Superstar in anticipation of the upcoming World Cup and construction crews continued work on the new six person lift being installed on Snowdon. It was gratifying to see five or six inches of snow on the ground, a reminder that winter is right around the corner. The K1 gondola was on hold for ice, and we booted up and joined the mass of skiers in line. Soon enough we were on our way up the mountain. The top was socked in with clouds and intermittent flurries but the snow was soft and everybody was smiling. In spite of signs warning about a lack of beginners’ terrain, we saw a snowboarder getting a lesson from a buddy near the top. 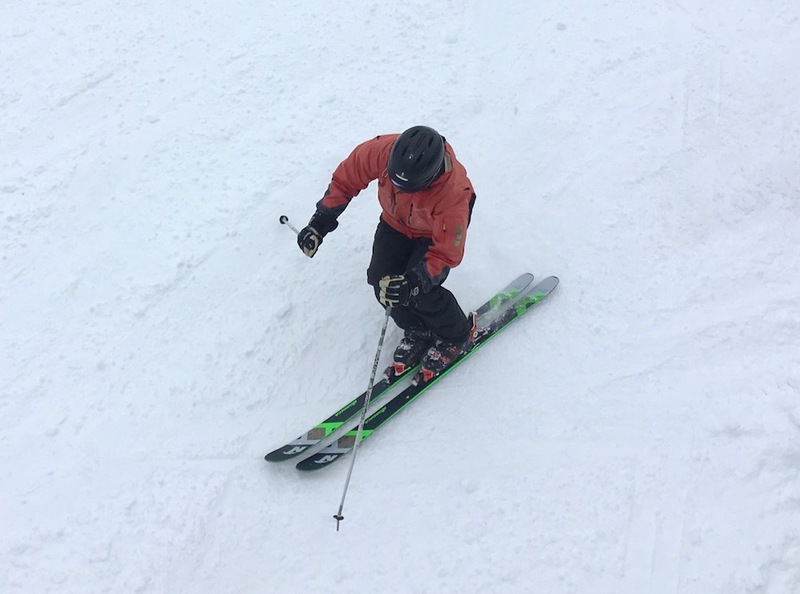 About halfway down to the North Ridge Triple, we saw a intermediate skier get taken out by his raw beginner girlfriend in a classic slow motion collision, ending with each clinging to the other for support. It takes all kinds and everybody has to learn in their own way. Early season days aren’t for everyone. The line to get on the triple was long most of the day. There wasn’t a lot of terrain open and what was open was pretty crowded. 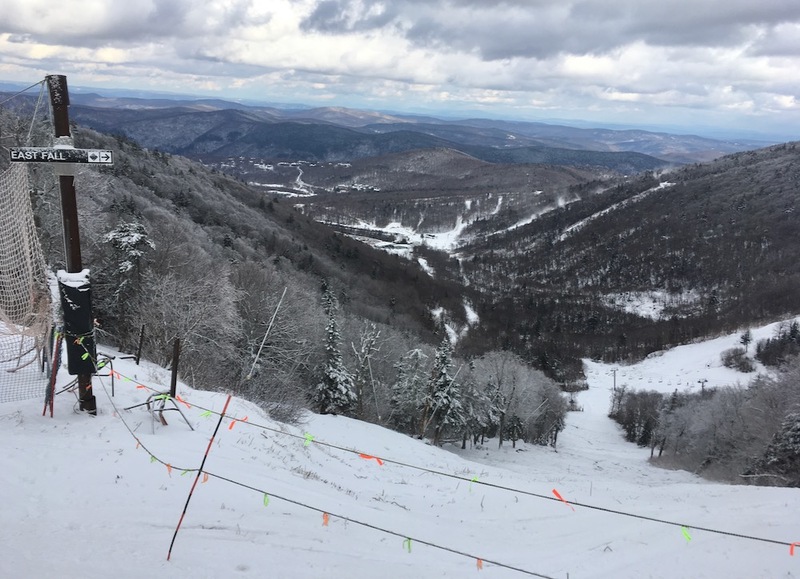 But hey, we were skiing in early November and Killington has been open for three weeks. That’s amazing. After six months off, my legs weren’t ready for hot laps on Freefall anyway. Short radius turns on high quality manufactured fluff was just what the doctor ordered. It was a good day of skiing in a cloud surrounded by kindred souls, everybody with the same stupid grin on their face. Enthusiasm made the day. Lifties, snowmakers, patrollers and the dude selling beers and bratwurst were high on stoke. As far as I was concerned there was enough natural snow on Great Northern to bypass the download to the base. 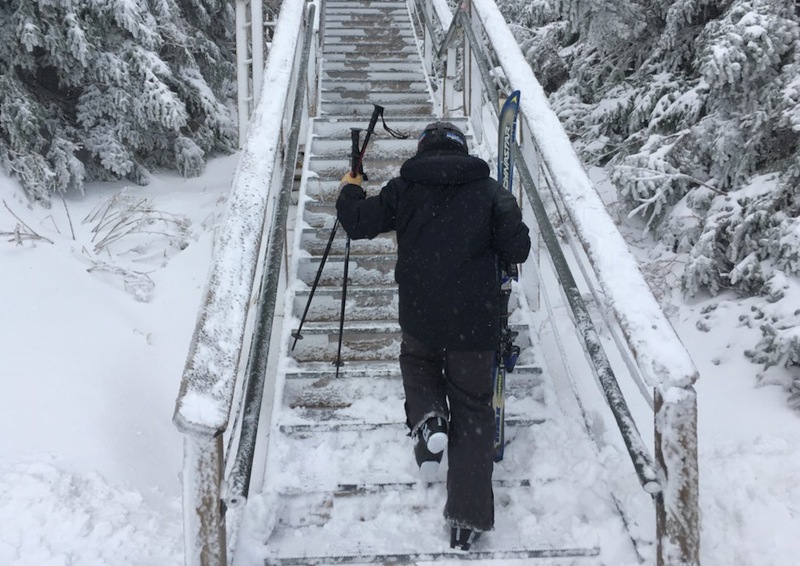 But at our days end, we did what good customers do, climbing the stairs up to the catwalk and across the front of Killington Peak. It was a treat for Junior since he’d never experienced the catwalk before. After a quick break in the Peak lodge, we downloaded the gondola and made our way back to the car, exhausted but happy to have gotten our season off to a great start. Thanks, Brownski, for a great post! My boys can’t wait to get out on their snowboards! Our legs aren’t ready either though need to get started. 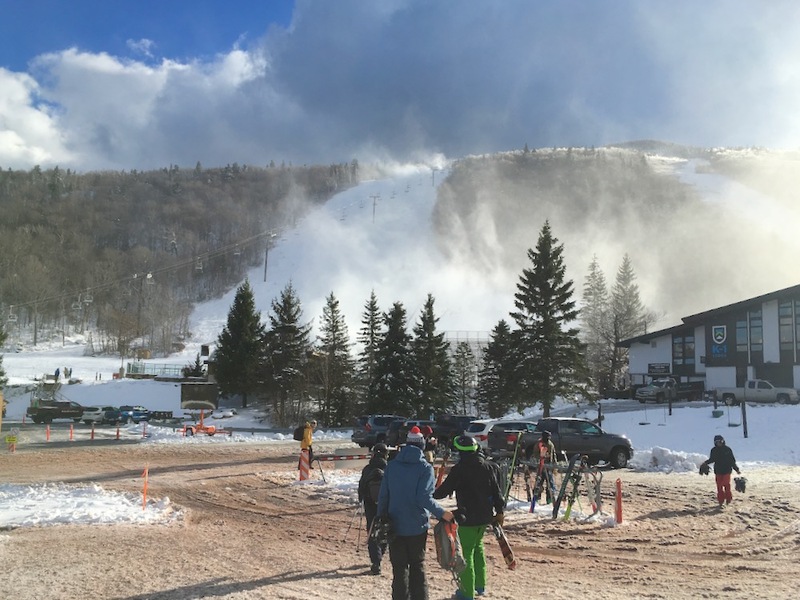 Thanks for sharing this story and for sure, we agree that Killington makes incredible snow. 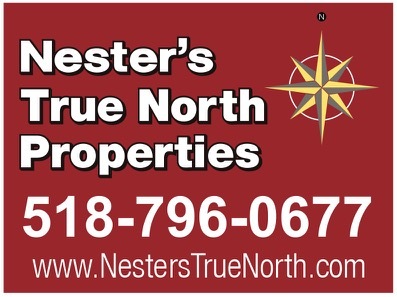 See you there this week. It’s going to be a good week for making snow. Thanks guys. I’m not getting out again for a little while but I’m hoping conditions live up to everybody’s expectations. Full steam ahead!